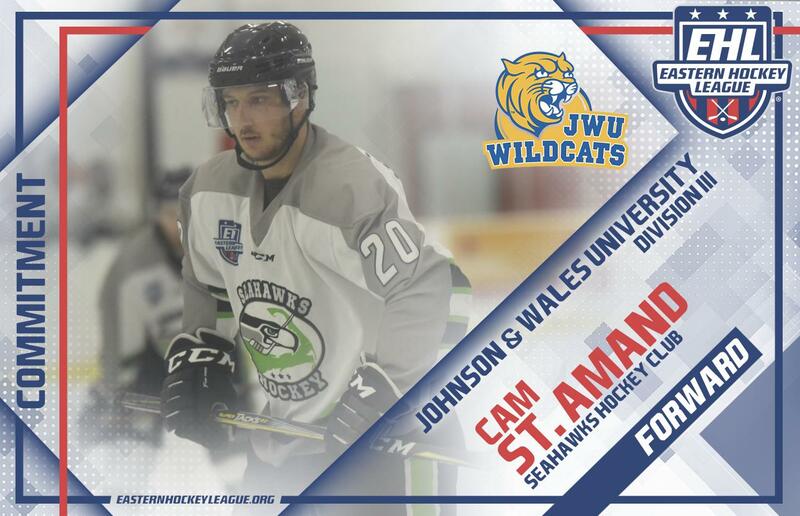 DENNIS, MA -- Cam St. Amand, a forward for the Seahawks Hockey Club, has committed to Johnson and Wales University (JWU) for the fall of 2019. The '98 native of Cumberland, RI is in his first season with the Seahawks, and to date, he's tallied 21 points through 37 games. "Cam has done a great job for us this season, and we are excited for him and his family to have received this great opportunity," said Seahawks head coach and general manager Bill Zaniboni. With St. Amand's commitment, the Eastern Hockey League (EHL) has now sent at least one player per season to Wildcats, ever since the league was formed back in 2013. St. Amand is the 22nd player in league history to make this decision, and he's grateful to be spending his final year of junior hockey in the EHL. St. Amand and the Seahawks are in a tough battle with the East Coast Wizards and the Connecticut RoughRiders for the top spot in the South Division of the New England Conference. In all likelihood, this three-way race for a First Round bye will come down to the final weekend of the regular season. Looking ahead, the Seahawks have a pair of key home games this weekend against the Connecticut Chiefs and the New England Wolves. Learn more about the Seahawks Hockey Club on the team's official website, and check out the full 2018-19 NCAA commitment list.